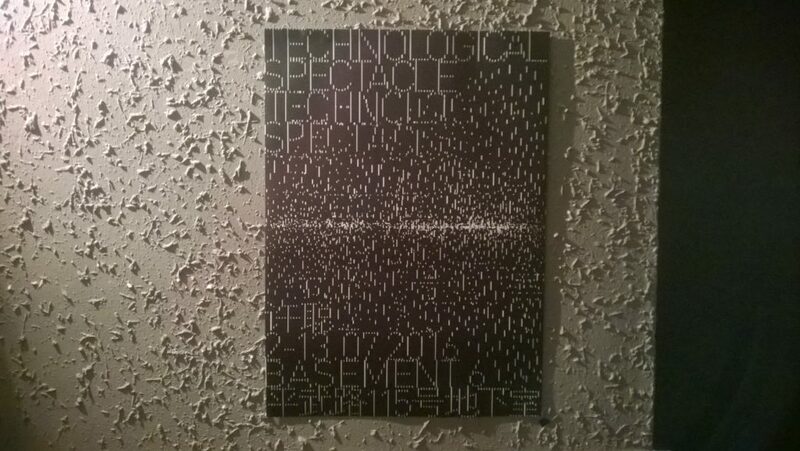 One month ago I happened to drop by Basement6 right on time for the opening of a solo exhibition by Shangainese artist 许聪 Xu Cong called Technological Spectacle and curated by Katy Roseland. 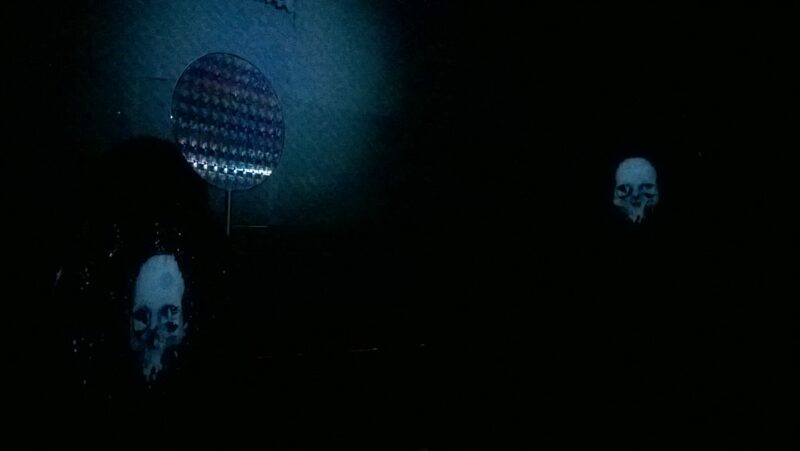 The installation formats were standard fare for a media art show – a flat screen TV, projection mapping, augmented reality, etched silicon wafers – but the real surprise was in the content of the artworks, rather far from the tongue-in-cheek technological criticism or self-satisfied abstraction of most contemporary trends: the large flat screen displayed a morphing arrangement of design elements from Buddhist websites; the projection mapping emphasized the cartographic shapes outlined by the flaked paint of the Basement6 walls; the augmented reality markers made precariously rendered plums of smoke or flames appear in the live-streamed hands of passing audiences; the skulls etched on silicon wafers were a declared reference to the famous Dream of the Red Chamber episode “Jia Rui Looks into the Wrong Side of the Precious Mirror of Love”. Xu Cong put technological infrastructure and digital techniques at the service of all too human concerns: religion, magic, death. He was also kind enough to walk me through the artworks and answer a few questions about spirituality and the Internet in China. 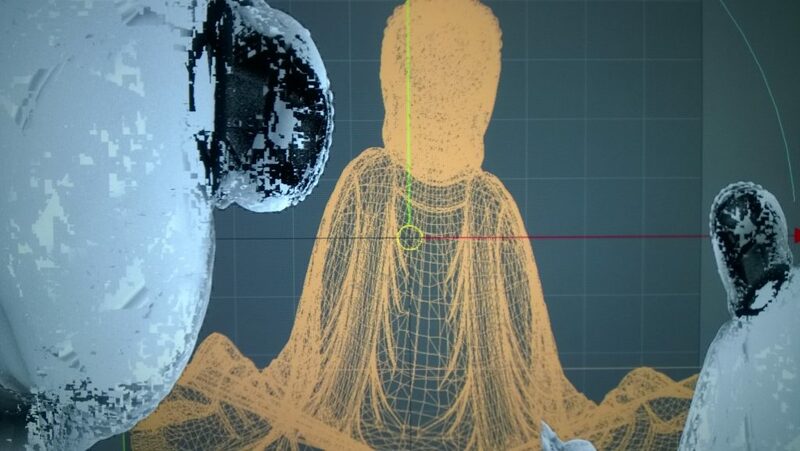 Let’s talk about “isbuddhaonline.com”, the first artwork one encounters when walking into Technological Spectacle: could you introduce its content and the thinking you wanted to convey through this work? The first time I heard of online shaoxiang [burning incense], I almost didn’t trust my ears. I always thought that something so clearly offline as shaoxiang was a good example of a weak point of the Internet, because as a practice it relies on the spiritual power of religion, on the intensity of ritual feelings. But after finding and experiencing several shaoxiang websites, I was still quite surprised and perplexed: why would people use websites so simple and poorly made? Some of these websites clearly had malicious scamming purposes, did users really believe in them? Is Buddha really online? Why can’t Buddha be online? Moreover, when I discussed online shaoxiang with my friends, asking them about their opinion, I found that people weren’t happy to debate this topic, and nearly everyone unanimously expressed their disdain, sometimes to the point of getting red in the face and questioning my problematic position. This sort of overwhelming reaction bordering on extremism created a striking contrast with the thousands of repetitive “烧香” (shaoxiang) messages left by users of these websites: there seemingly wasn’t an intermediate zone between these two positions that people could inhabit. This phenomenon is really fascinating. The same sort of splitting works similarly on my own person. On the one hand, I laugh at the superficiality and utilitarianism of these practices; on the other, when I choose to make this “scene” come together in front of me, seeing a picture of the Buddha through the smoke curling up in the air makes me feel a kind of truthfulness. The Internet is the hottest industry at the moment, and it has dramatically enriched China’s present-day material standards; the “xuqiu+hulianwang” [“demand+Internet”] creative thinking does really put our Internet technology and our understanding of it in a globally leading position. It’s a site of experimentation, and we don’t even talk about “online” and “offline” anymore, because we have been getting used to living online for many years now. Add to this the protection of the Great Firewall, a huge userbase, a low-cost workforce, all kinds of information monitoring systems and so on… occasion after occasion, the Chinese Internet precognizes things that could happen in other countries in the future. China has become a country that exports Internet thinking. The combination of “shaoxiang+Internet” does perhaps feel really weird for a lot of people, but isn’t this precisely the “direction” our society is moving towards? Here there is no absolute good or bad – on the contrary, it all depends on people’s choices. We all confront choices, and the future is the result of our common choices. How did you come in contact with these shaoxiang websites? At first I vaguely heard someone mentioning them, then I searched on Baidu and got a lot of results, finding shaoxiang websites of any kind, and I found them really interesting. As an artist, how do you approach this peculiar kind of Chinese website? Do you think the Chinese Internet is a peculiar environment overall? To be honest, I think that these websites aren’t peculiar at all. In our everyday life online we already see some peculiar pieces of Internet culture that already have ten or more years of history. The Chinese Internet environment isn’t peculiar, but it’s “magnified”: it is an enlarged version of small details of the Internet in other countries, an enlargement of desires, of productiveness, of commerce, and of control. In this sort of environment, a lot of Internet companies have accomplished astonishing feats; in a way, for example, the goals pursued by a huge company like Facebook have in fact already been realized in China. What relationship do the ‘digital’ and the ‘material’ have in your artworks? I think I wouldn’t differentiate between digital and material. But the way of working I’m more used to consists in reproducing the exhibition setting digitally to the best of my ability, then adjusting the artwork in its virtual form, and lastly installing it on site. Maybe the digital and the material are both tools. I’ve just started doing art, so I’m still searching for a direction. Are you interested in the relationship between media and religion? I have read Amusing Ourselves to Death by Neil Postman, in which he examines how changes in communication media lead to changes in different aspects of our lives – among these, he specifically talks about televised preaching in the US. The author was following the leads of McLuhan, and in their times television was a new medium, so it was natural to discuss the changes brought by it. In our times, examining thoroughly the Internet from a media theory angle attracts me a lot, so this is one point of view I’d like to work from. Lastly, how do you define your artistic domain? 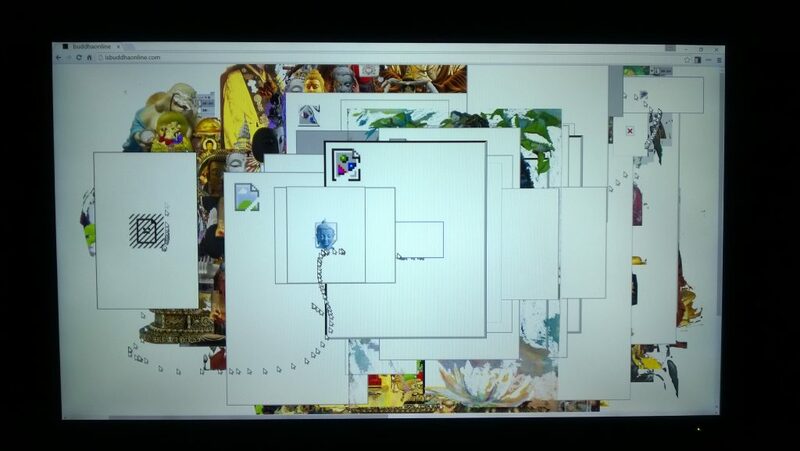 Is it digital art, new media art, or what? How did you come in contact with this form of art practice? 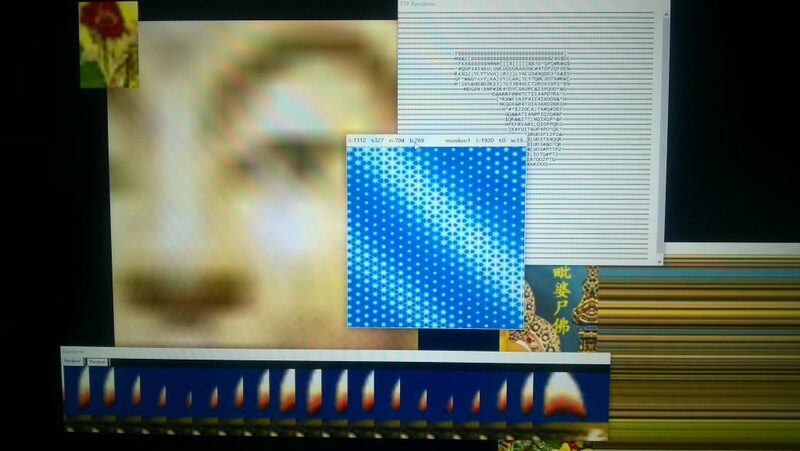 I would say that my work belongs to “media art”, because the so-called “new media art” doesn’t fit our times anymore. 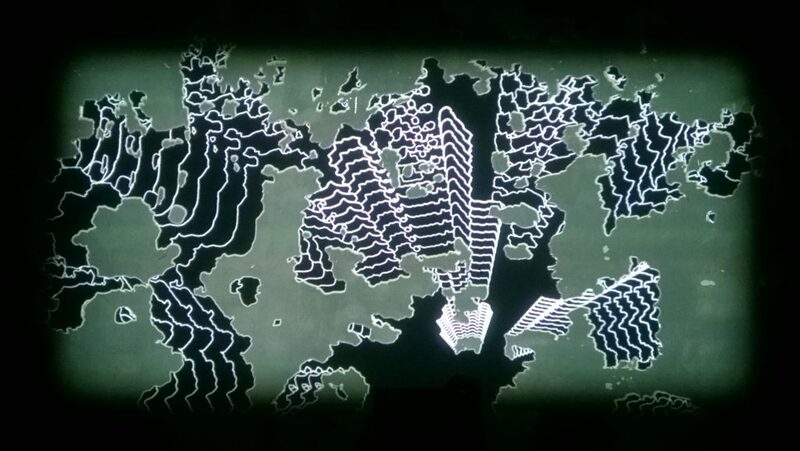 The first time I encountered this art practice was in university, when I read some materials about the ZKM (Zentrum für Kunst und Medientechnologie, Karlsruhe) and about media art in general; it quite interested me, so I kept researching about it by myself. In Shanghai there is a lot of artists working in this direction, so I also go check out their exhibitions and performances. – Postman, N. (1986). Amusing ourselves to death: Public discourse in the age of show business. London, United Kingdom: Penguin.